Finally looking to get my first car, hoping to keep it for the next 7-10 years if new and possible. Just looking for something safe and reliable. Will be used mostly to commute less than ten miles daily but would like enough off road capability and ground clearance for bumpy, sandy, Arizona backroads. Enough space to throw some hunting gear and maybe a couple of buddies. Have been eying Crosstreks, Outbacks and HRV's mostly. I am open to anything that will survive our heat and keep me alive in a crash. Everything else I can compromise on to an extent. Not afraid of some maintence and love, such as the Subaru oil consumption that some have. So long as the car lasts and gets me where I need to be. Doesn't even have to get me there quickly. A little over six feet tall, so a little leg/headroom wouldn't hurt. Ability for a hitch to tow a light trailer (single dual sport bike levels of light) would be nice but not needed. Auto/CVT prefered. Girlfriend is adamant that it has safety package like Subaru Eyesight or Toyota Sense, and android/apple play, she prefers new but I am flexible on used personally. $28K is about as far as I can go, a bit under wouldn't hurt. Anything over that would have to be GM group or Ford due to some family discounts. Not trying to sound too picky. Just giving as many details that might help, and know I'll probably have to compromise on a few things. Thanks for any and all suggetions and advice. Crosstrek's and HRV's are a little tight for four guys and gear. Outback or Forester would be better options from Subaru. Forester is more upright and may be better with headroom. Slater's comments on size is spot on. Outback or Forester are going to be your best bets. Although the OB and Foz shapes are different their actual passenger and cargo area is within 10% of each other, they just load differently. Safety features, off roading and towing capabilites are the same as are the mechanical details. Outback will be quieter and more comfortable, but that comfort will cost ~ $3K more. Try em both and the decide on which one best fits your needs and budget. Both of the above comments are excellent, and you are aware of the TLC some Subarus (about 10%) need to watch their oil levels (as I do). They are pretty bulletproof besides that for the most part. You mentioned a Ford/GM discount. There are a couple of models that could meet the need their as well. 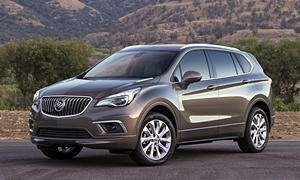 One is the sometimes overlooked Buick Encore. It is one of GM's reliable cars/SUVs. The first two years of production are to be avoided, but by year 3 (2015) the kicks were worked out and Consumer Reports gives ita prefect reliabliity record essentially (some minor issues with climiate control in 2015, but no other issues from that point on). That can definately tackle minor offroad obstacles you are describing. The bigger Buick Envision is also a pretty good, reliable car. Some don't like the way it drives. I own one and think it is quite sporty. Some don't like the fact it is made in China by GM. Doesn't bother me. Since it was made two years there before being imported for the USA in 2016, it has been reliable out the gate although some electronic controls were reported as problems in 2017. I have a 2018 and only 2500 miles in the first month, it has been great for me - even in the limited offroad situations I have been in. You can get massive discounts on the 2018 right now as the 2019 launched this month (May) so I got over $12,000 off on the car I bought in April. That is a lot of repairs that can be paid (not that I plan to have any - my previous GM Saab lasted 12 years and 170,000 miles until a tree ended its life last month). I am not a huge fan of Ford although they do make some okay cars in reliablity. Their interiors are not the best. Just drove the last three days a Ford Explorer and hated the interior of that car - cheap plastics everywhere and it was a top of the line model that would have cost me $50,000 to buy. Not worth it from what I saw even though it drove okay and got 20 mpg on the highway. I don't think the HR-V or any Buick would be fit to off-road. The Forester seems perfect for you. It is cheaper than the Outback and you can get a pretty well equipped new one in your budget. The Toyota RAV4 is another good one, but doesn't have CarPlay or Android Auto until 2019. They are more reliable than the Forester and are decent at off-roading. The Adventure trim adds an upgraded radiator, transmission fluid cooler, and engine oil cooler for towing. The safety features are standard on every trim. The interior is more rugged than most compact SUVs. Despite the adventure commercials RAV4 AWD system only transfers 45% of its available torque to the rear wheels(just like Lexus NX and RX). Where the Buick Encore sends 50% torque to the rear the Buick Envision Premium 2.0T can send 100% to a single wheel. The better torque distribution of the Buick even.works on wet pavement and snow as our 2016 Envision has no problem propelling itself in every scenario it had power of 250 horsepower where others only have 180 to or so. Plus the GM Active Twin Clutch AWD is always on unlike Subaru X-mode button require pushing and shuts off at 18 mph and Buick 4-years, 50,000 miles warranty. Here is 2016 Envision 2.0T just off lease for $25,000. Used 2016 Buick Envision Premium I for sale at Grossinger Chevrolet in Palatine, IL for $24,995. View now on Cars.com. Also, the Forester has an optional 250 hp engine, which you can get for $30k list. Envision is a different class of car, but the $43k turbo model is way out of the OP's price range. Outback 3.6 has over 250 hp. I sound like a Subaru fanboy, but full disclaimer, I drive a VW and my wife drives a Lexus. Just trying to keep it fact based here. Subaru is 50/50 split until it senses slip as long as the steering wheel is straight or just off center. Any more steering input and not all four tires get power as proven in this video of a Forester. Even the CR-V can pass the test video below. There is another of a Crosstrek on rollers thay won't off of the roller test and the CX-3 does. LOL, Norm you posted two videos to Mazda sponsored events, so predictably they figured out a scenario where the Mazda looked better. They figured out that a Subaru's AWD limits power when turned at full lock to lock and did a test to exploit this which is not relevant to real world driving. I'll take a full time AWD Subaru vs a front biased mini SUV any day in real world driving if I were to get an AWD car and actually needed light off road ability. in snow or loose gravel ? With around 300 lb-ft of torque in the 2019 Buick Envision 2.0T it doesn't take much to spin the tires on a wet surface to make a quick turn into traffic. With only a 180 lb-ft of torque in most 2.4/2.5l 4-cylinder and AWD you won't be let down on any surface and in any conditions. 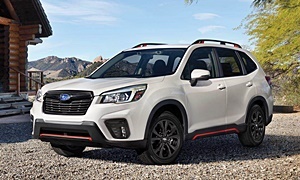 That 2.0T is something the 2019 Forester XT is not getting as it discontinued. in snow or loose gravel ?" Not at full lock? Do you turn your wheel until it stops making a typical right hand turn into a driveway? I doubt it. You probably turn it less than 50%. Only scenario that I go full lock is making a U turn on a tight road. And my FWD car does just fine with snow tires. Travel to the east coast and experience tight roads like they have in Pennsylvania and you understand how the Subaru system will leave you spinning. I own both a Subaru Legacy and the Buick Envision. I live exactly in the situation Norm describes and as in that video shown by Mazda. The Subaru is not as good in that situaiton getting out of my driveway, plain and simple. Still, it has enough power to get out into the street. I personally think the Subaru system is very good. I also think GM's relatively new double clutch transmission developed three years ago is a better one used on the Regal, LaCrosse, and Envision. As far as I am concerned, both can meet this individuals need on and off road. I have already taken my Envision off road and it has the clearance about equal to the Forrester. The Legacy I own has less clearance but handles better than the Forrester as a result. None of these cars are meant for serious offroading, but the writer above is not looking for that. I stand by my statement previously - you won't go wrong with either choice. I will say this - at $28,000 and since Subaru's are cheaper it is far more likely he will find a car in his price range with that rather than Buick as the best he can do is by a used Buick that will meet his price. Seems like there is always an ongoing debate about who has the best AWD system. Because Subaru is the dominate AWD car maker they are naturually the target the other AWD makers wannabes who would like to take Subaru down a notch. If you believe that sales are an indicator (I do) consider that Subie has sold over 600,000 AWD vehicles in the US for 8 years running. It also has extremely high customer loyalty. I think that speaks volumes. Both AWD systems are good. I hear a lot of good things about both. When I go up north to Oregon and around Seattle or to any place it snows, 80% of the population has an old Subaru Outback or Forester in their driveway. I just can't see myself taking an almost-luxury Buick Envision off road (I mean on a sandy dirt trail). The Envision is not the car someone would use as a "hunting vehicle" to drive over "sandy, bumpy Arizona backroads." The fact that someone would suggest any luxury SUV for off-road duties is hilarious. That is why a Subaru or some economy mainstream rugged SUV like a Forester or RAV4 makes sense for the OP's situation. Even the Crosstrek is better since it is economical, has good resale value, and is one of the most comfortable mainstream compact cars on the road. You'll be scared to break any little thing on the Buick while off-roading. Lectrofuel, what may I ask would break? I don't expect anything to break in my car - and I do plan to take it off road to camping in a lot of environments starting this summer. I would not have bought it and bought another Subaru if I thought like you do. I still stand by my statement - both can do limited offroading and I own both (have taken the Legacy for camping, but the clearance underneath the car I have to be very careful with - plan to transition to the Buick this summer). Want something more serious? Don't get either the Subaru or the Buick - they won't do it. Transmission overheating, alignment issues, scratches, damage to the undercarriage, general wear and tear, possible warranty invalidation, crashing into a tree, Subaru has an interior that is more durable, I doubt the Buick has a suspension that is built to go over rocks. I wouldn't do these things to my $40k "luxury" car. I don't know if we are on the same page, but I'm talking about driving uphill over small boulders, not a steep dirt trail; most cars can do that. My uncle used to do this regularly going up a mountain in Idaho with his 2005 Outback. His car did well, but it definitely put a lot of wear and tear on it. Better to happen to a non-luxury Subaru than a Buick. Subaru markets their cars towards people who live in the snow or light-to-moderate off-roading. Buicks are highway cruisers that are good for going to the mall and driving in the snow and on a dirt trail. For example, an Outback is more fit for off-roading than a Mercedes E-Class wagon. Subaru designed the Outback to fight the elements of off-roading while the Mercedes was designed to get groceries or drive in snow. I agree with danlisahall on the sales component of the debate. It isn't that Buicks are more expensive because they are just as attainable as Subarus. When you Google "Buick Envision off-road" there is one site that has a review where they went through a "pasture" and said it performed well. When you Google "Subaru Outback off-road" there are dozens of sites that have content and say it excels at it. If I had a priority when buying a car I would choose the car that is known for doing it well. I don't doubt the Envision would tackle uneven terrain better than the Legacy because the Legacy is a sedan that doesn't have much clearance. I'm pretty sure the Envision has less than the 8.7 inches the Outback has, though I can't find it anywhere because Buick owners don't usually take their cars over rocks. Subaru doesn' even have enough power to spin it's wheels. Lectrofuel hasn' seen a Great Lakes area pothole at winter time. These take out tires and break wheels if not taken carefully. That stuff people are video recording are known obstacles usually taken at crawling speeds. Not like taking some 3-6" deep road hole at 35 mph. "Subaru doesn' even have enough power to spin it's wheels." The commenters on the video pointed out that the driver didn't turn off traction control during this test. Surprise - traction control is designed to prevent tire spin and should have been turned off during off roading. The testers concluded at the end of your video that "it is amazing how far it made it" and they were generally very impressed.... but you point to the one area of the video where the traction control worked as some kind of negative? The driver commented he was full throttle and watching the video will tell you what wheels were spinning. X-mode or not it looks like the TC still engages, that is until the tires have grip and the engine cannot propel them anymore. I'l have to watch it again later. 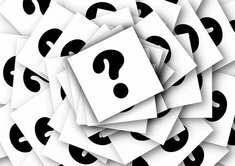 Lectrofuel I agree with you 100% of the time but the way you are answering the question is not the question that was asked. Look at what you wrote: "I don't know if we are on the same page, but I'm talking about driving uphill over small boulders, not a steep dirt trail; most cars can do that." 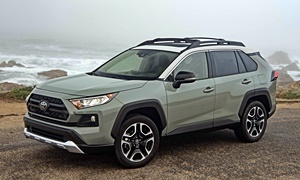 "Will be used mostly to commute less than ten miles daily but would like enough off road capability and ground clearance for bumpy, sandy, Arizona backroads." This is the only thing I see different about your answer and mine. We are not talking about small boulders. We are talking about a bumpy, sandy, backroad. Ergo - both my Legacy and Envision can do that and I have already done that in both cars in CT. The Envision if I measure seems to have about 8.5 inches of clearance, the Legacy 7 inches. You are right, that Outback following the specs has 0.2 inches more clearance. Not significant in my book. The Buick can handle what is described. Outback is definately more heavy duty - I never debated that. I just answered the question asked. No disrespect intended - I still stand by what I wrote for this purpose, either can work (and work for me for camping - which I did last week in upstate NY offroad in the Envision - just like I did with the Legacy last year). Nothing went wrong in either case and I crossed a few small rocks in both cases. I agree with you that the Buick AWD system and off-road performance are good, but my point is that many people like me prefer to take a cheap SUV off-road instead of a $40k luxury SUV. You don't have as much to lose with a cheap car when you off-road and accidentally hit something or bottom out. For example, taking a Bentley Bentayga off-road vs. a Buick Envision. You choose which one you think performs better on a "bumpy, sandy, Arizona backroad," but I surely wouldn't take a Bentley off-road because I would have a heart attack if I scratched the paint. This is a more extreme comparison than the Envision vs. Outback that shows what my point is. Take your Buick off-road, but I think it is better to put wear and tear on a used $10k Outback than a new Buick Envision. Okay, get your viewpoint Lectrofuel - you don't feel comfortable in a Buick going offroad. However, like I mentioned, I got mine at a price below an Outback - below $40,000 (actually, few thousand less that that) for a fully loaded model. So mine was cheaper than the Outback. A loaded Outback cost me more (I did a price comparison as I did consider the Outback as well). I don't have a problem taking a Buick offroad and it is a more comfortable car. The video I looked at from NormT is about the limit I see on a Buick - small rocks and dirt and water. An Outback can do more, and that Buick Enclave is far bigger and heavier (and more expensive) and not well suited to going offroad. I needed a car that can do limited off-road for camping, could carry a decent amount of stuff, and I would not have to worry about breaking it or breaking down. I looked at the Outback, Forrester, Envision, RX, and X3 (I eliminated the sedans I looked at due to cargo capacity limitations). Note, only the Subarus were in the family car catogory. I do understand your reluctance to drive (or recommend) a more expensive car, I just don't have a problem with it especially if you can get that more expensive car for less than the equivalent Subaru like I did. Fixing it won't be more expensive it any case as they are both reliable and parts are not much more expensive on the Buick. Thanks for explaining. I'm awaiting AcuraT's Buick Envision Love Letter review on Truedelta. A nice Michael Karesh style review would keep you busy at night around the camp fire. WOW! Did Sharkfan know what a debate he would ignite? I'll bet he got way more info than he bargained for - at 27 posts this may be a True Delta record! 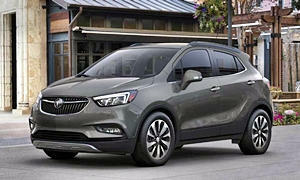 The Envision Premium has 19' wheels with max all season tires that work good on the dry or wet, not sure about rock climbing but the Buick has 8" of ground clearance . Mudding in a Subaru Outback. Anyone willing to try this in their Buick - any Buick? Those examples have off road mudder tires. The first video has white lettered tires and petersout in typical Subaru Asymetrical fashion with the wheel turned then he turned it straight and it went forward. The second one has knobby tires and a 2" lift and obviously lacks power where the V6 Jeep just keeps going. Danlisahall - thanks for sharing. That black bear video was fascinating to watch and actually proves my point. When the climb gets that severe it pushes the Subaru to the limit and gets stuck a few times. The Jeep gets up no problem - of course it might break down on the way :-). Could the Envision do that? Probably, with the same difficulty of the Subaru. Although it does have more power (the Subaru has less than 200 hp with that boxer engine (like 180), the Envision has 252 hp and is not much difference in weight (3624 to 4025). Your other question, would a Buick owner take it up there? Probably not. Most Buick owners are not as adventurous as Subaru owners - I have no problem admitting that. Would I take mine up there if I went to that mountain? Probably - because as I mentioned I paid less for my Buick than that owner did for that Subaru most likely. I hope to take my Buick up a mountain next summer when I take my kids camping again. Don't know if I will bother filming it, however.